Oh, what a beautiful collaboration this is! 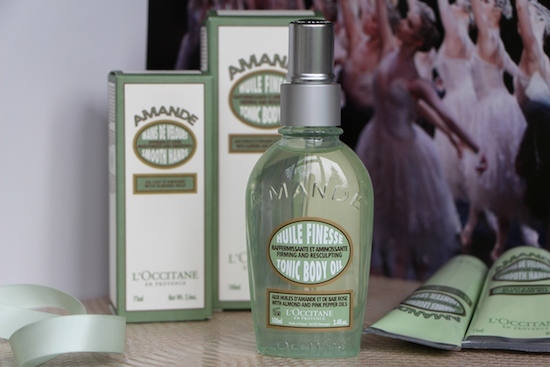 I already adore l’Occitane’s Amande range with its perfect green and white packaging and its warm, comforting scents, but throw a bit of ballet into the mix and you have something quite gorgeous. 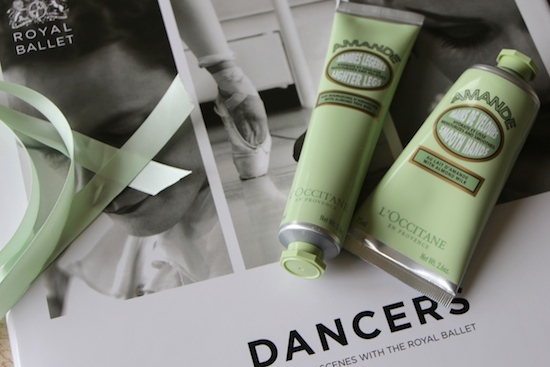 l’Occitane have teamed up with The Royal Ballet to produce an exclusive drawstring bag that’s filled with three ballet dancer beauty essentials; the firming and sculpting Tonic Body Oil, a tube of Lighter Legs and the Smooth Hands hand cream. The Tonic Body Oil is an interesting one; it’s light enough that you can spritz it on from the glass bottle, but it still manages to behave like a far richer oil once it’s on the skin. You can really get quite a good massage going with it, which helps when you’re trying to improve the skin tone on areas like your thighs and hips and tummy. I never feel that there’s much point just slathering stuff on – you need to have a bit of a pummel to get the old circulation going! Anyway, I like that this oil is spray-on – very convenient – and I also like the heavy bottle, which feels luxe and expensive. The Lighter Legs is another surprise; I always underestimate these leg cooler things that come out every summer, dismissing them as gimmicky. This one is supposed to relieve the feeling of tired legs and feet when you massage it in; it’s a light gel-cream that has a zingy, slightly tingly aspect to it that instantly cools your skin and makes your legs feel less heavy. Lighter Legs is an apt name, I think, it does work very well. The last tube in the set is the hand cream, Smooth Hands. It’s lighter than l’Occitane’s classic hand cream, without any trace of greasiness at all, so ideal for use throughout the day. All of these bits and pieces would cost over £70 bought separately, but the Royal Ballet set, with its be-ribboned bag (that could make quite a nice shoe bag for your special ballet pumps?) costs £49. A nice gift for someone special, if you can bear to give it away, but also a good saving on the individual products if you’re a regular stocker-upper of the Almond range. Note that these body products don’t have quite the same scent as the original Almond Milk Concentrate, one of my absolute favourite beauty products of all time – the scents are lighter and fresher. But the Tonic Body Oil layered beneath the Milk Concentrate is just dreamy! I’ve always had a bit of a thing for the ballet; it’s a magical, beautiful world that is so far removed from the reality of my daily life that I just find it fascinating. I only did ballet until I was about ten because I was useless at it, apparently – quite clumsy and graceless, said Miss Latham. I think. Don’t quote me on that. Anyway, I shall be imagining myself as a prima ballerina when I apply my Lighter Legs and my Body Tonic; hopefully the towel rail in the bathroom will survive my clomp-footed attempts at “pliés” and not fall off the wall. Again. 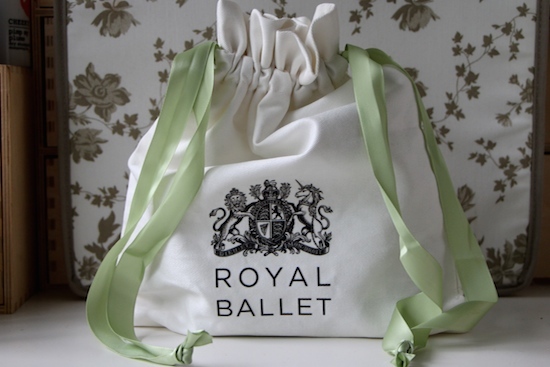 The Royal Ballet pouch is available online here.